This is my second travel guide to Pangasinan, the province that we from the metro Manila always take it for granted because it is just 3 - 4 hours away. Often, when we are given a chance to choose between two destinations, we always choose the farthest. While 6 days in Pangasinan is not enough to make an ultimate guide to Pangasinan's tourist spots, my short visit somehow gave me a glimpse of so many off the beaten paths that we were able to see ourselves! The province of Pangasinan is composed of 44 towns or municipalities. This one highlights the tourist attractions of only 4 of them: Malasiqui, Bautista, Santo Tomas, and San Jacinto. Would like to tell you though, if you're looking for an Instagrammable place, these parts of Pangasinan may not be the best place for you. However if you're looking for a genuine representation of what a typical life of a Filipino who lives outside Manila, this is it. We know there a lot of provinces in the country blessed with otherworldly tourism destinations. Santo Tomas in Pangasinan is not. The smallest town in terms of land area and sandwiched between the towns of Rosales and Alcala, Santo Tomas is a certified agricultural land that grows rice, tobacco, and lots of corns. In 2008, Santo Tomas got its first ever Guinness record for having the world's longest barbecue made of corns. Recently, the town attempted another world record for having the longest picnic or lines that's 6 kilometers long. They cooked thousands of kilos of pork, lots of veggies, adobo, and a local food made of corn. Do you know that long before the current Philippine president's campaign to stop drug addiction, Santo Tomas has already solved this problem? This town is proudly and certified drug - free municipality in Pangasinan, if not the only one in the Philippines. Former Dangerous Drug Board Secretary Antonio Villar's efforts as a public servant here took him 20 years to declare this town, drug - free. Without its own proper dumpsite, this town is "ironically" and surprisingly one of the cleanest towns in the province. They got community projects that teach discipline to its constituents about proper waste disposal. They even have this festival, the annual Pasko sa Basura contest which is the little known counterpart of Pampanga’s Lantern Festival. Unlike this latter, Pasko sa Basura of Pangasinan taps its most creative locals to use recycled materials to build the biggest and most colorful lanterns that can be compared to the one in Pampangaa. No beach, mountains or rivers in this town. Here's a few that you can check out. Santo Tomas' Municipal Hall and the statue of a corn commemorating their Guinness world record for the first time are both worth a visit. The St. Thomas Aquinas Parish Church for Catholics is another one. There's a Tabing - ilog spot in Barangay San Jose which was named after a defunct TV series showing the laidback life of people living nearby the river. Every Filipino knows how to sing the National Anthem which is the "Lupang Hinirang". This song was written by Jose Palma in Casa Hacienda, in Barangay Poblacion West. Generals Emilio Aguinaldo, Antonio Luna, and Douglas Mc Arthur used this house as well for meetups of their comrades. Sadly, this house is rotten and occupied by informal settlers. It is not even take care properly. 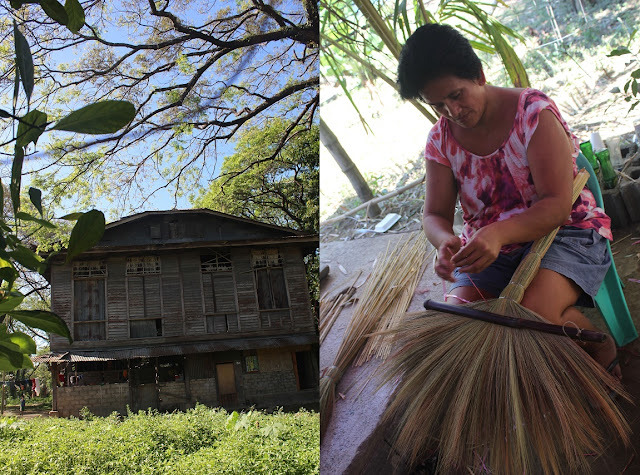 As the Walis Tambo (broom) Capital of Pangasinan” the town of Bautista especially in Purok Tanubong, you'll find the best products of brooms. Tanubong shares its name to this kind of grass used to make brooms. The grass of tanubong is much better than those in Baguio. Those are made of tiger grass which is of less quality. A walis tanubong even after it gets wet, lasts longer. Made by its locals 100% by hand, you can bring home for as low as Php 50 to Php 150 in these places: Bautista, Tarlac, and La Union. Wish they soon sell these in metro Manila! Rime Fallorina or Tatay Rime, is a 60 - something orthopedic practitioner who uses alternative medicine to cure knee, joint, and bone - related problems. He charges Php 300 to Php 600 for a half an hour chat with him. He does body massage so good! He was able to produce that crackling sound when he pressed my upper back body. Such a relief! He uses natural, plant-based, and organic medicines. His way of medication is approved and supported by the town's local hospital and the local government unit. Saint John de Baptist church built in 17th century is a great place to visit for Catholics. Jose Palma's historic house is not only an old house in Bautista. Siato’s house, a beautifully well-preserved private house built in 1923 can be seen from this church. You can't go inside but you can have your photo outside probably. 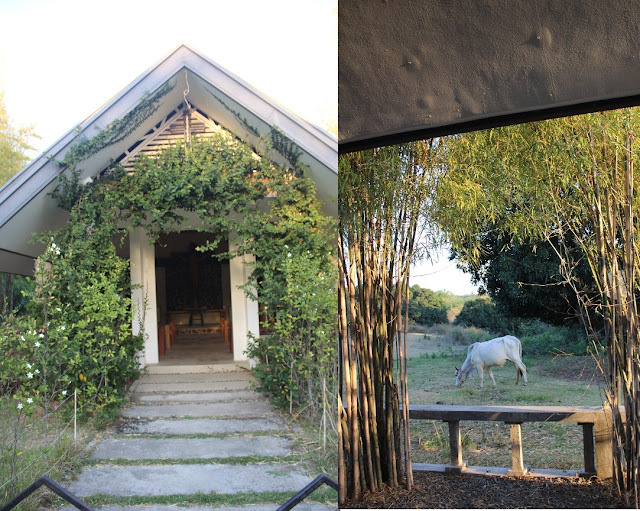 Malasiqui in Pangasinan is another alternative for those seeking some Catholic spiritual getaways. 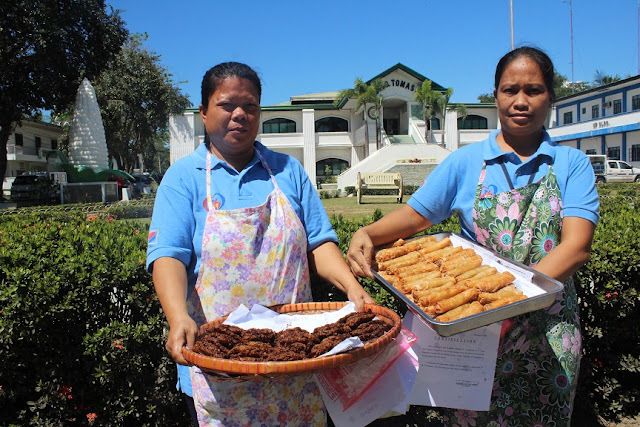 While yes, there's the famous Shrine of Manaoag, Malasiqui has a great potential to be added to the itinerary of a devote Christian in this province. First, is Saint Ildephonse of Seville Parish Church designed in Baroque Architecture. SeconD, is Saint Claire Monastery of St. James the Apostle located on a farm donated by a politician and socialite. Saint Padre Pio has a separate small chapel adorned with bamboo trees. Nuns can be heard singing and praying aloud at any given time of the day. Though they aren't allowed to physically interact with guests, they can give advice or hear your sorrows separated by the wall made of cemented grill so you can still see the face. A dormitory is currently built. For only Php 150/ night you can stay here on a dorm bed in the future. If Bautista is all about brooms, in Malasiqui it is bamboo products. In Barangay Pasima, families make kaing (bamboo basket), bilao (wooven tray), and bamboo drying bed One piece of kaing costs around Php 10 but without a handle. 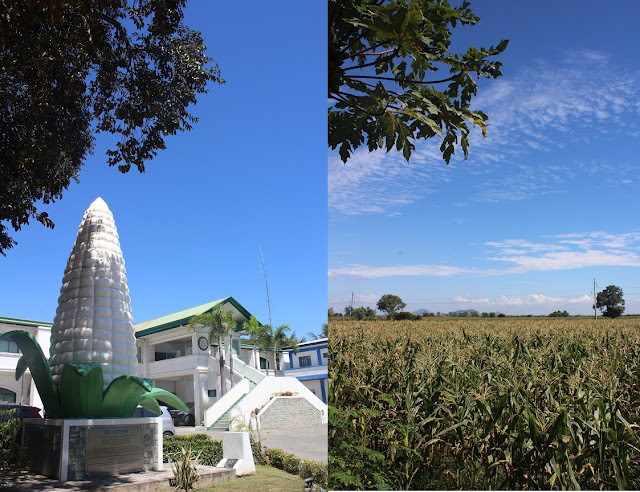 San Jacinto is closer to my heart compared to the other towns of Pangasinan above. It is landlocked like Irosin, my hometown in Sorsogon. I could totally relate to the locals how they live their day lives away from the bounty sea. As always, every church in every town is worth a visit like the Parish Church of St. Hyacinth in this town. 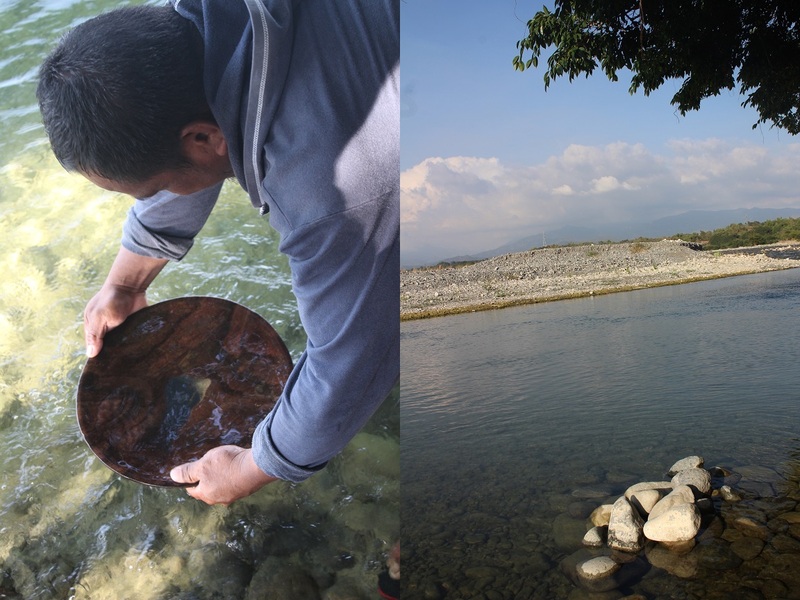 Gold panning along the riverbanks particularly in Purok Limingaling is one of the best experiences of my trip in Pangasinan. No other equipment but hands, these locals gather dusts of gold that are washed away from Bued river of Benguet. During typhoon and calamities they are able to gather more because these mining places from Benguet wash away lots of it. Another livelihood of San Jacinto locals are scraping bamboo skins that are made into flower baskets like in wedding, Baguio's strawberry farms, and home decorations. Though I forgot to ask how much it costs, I know it is pretty cheap. They also get these bamboo trees from other towns so that adds up to their expenses. Next time you need to know about what to see, things to do or where to go in Pangasinan, hopefully this travel guide should come handy to you.